Electric planes won't happen until battery technology improves by leaps and bounds. 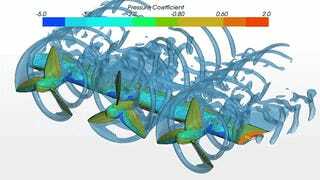 That's spurred researchers at NASA to take a different tack, testing a new style of wing that integrates over a dozen small propellers to boost efficiency, reduce drag, and make electric propulsion feasible for light aircraft. While battery technology has come a long way in the last decade, it's hit a plateau. Currently, electrically-powered aircraft using a traditional propeller are too big and too heavy, limiting cargo load and range. So NASA started with a clean sheet design, optimizing 18 electric motors with slow-speed propellers spread across a 31-foot wing. The result is a 60-percent boost in wing efficiency and a significant reduction in drag, but the possibilities are far more profound. Unlike bulky, heavy internal combustion piston and turbine engines, the relatively small size and low weight of electric motors allows for a massive amount of flexibility. Each motor can be placed precisely on the wing for maximum efficiency and reduced drag, and also operated independently at different speeds to optimize performance depending on the phase of flight. If the plane is cruising, certain motors could shut down, while their propellers fold to reduce drag even further. Multiple independent power systems also provide a robust and redundant propulsive control, with the speed of the motors optimized automatically and providing a backup in case of failure. Additionally, by evenly distributing accelerated air across the wing, the surface area is greatly reduced while still maintaining the same slow speed/stall characteristics. The smaller surface area, in return, generates substantially less drag as a byproduct of lift. NASA is calling the project Leading Edge Asynchronous Propeller Technology (LEAPTech) and testing it on the ground at speeds up to 70 MPH across a dry lakebed at Edwards Air Force Base. The experimental wing, called the Hybrid-Electric Integrated Systems Testbed (HEIST), is mounted on a specially modified truck where researchers can focus primarily on the takeoff and landing phase of flight. The next step in development, pending successful trials with the HEIST testbed, will be a small X-plane demonstrator. Within a few years NASA hopes to fly a manned aircraft, replacing the wings and engines of an Italian-built Tecnam P2006T with an improved version of the LEAPTech wing. Using an existing airframe will allow engineers to compare the performance of the flight demonstrator with that of the original P2006T. If it's proven effective, the scalable nature of electric propulsion technology could move from small, general aviation aircraft, up to commercial airliners.